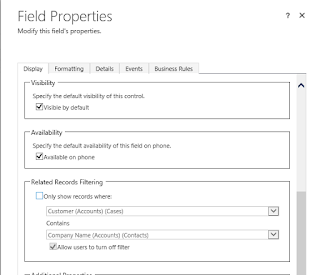 May be you have noticed, that there are two out-of-box lookup fields on case entity which point to the contact entity. One is called Contact (primarycontactid) and the other one is Resposible contact (responsiblecontactid). There is a significant difference between these two fields, which limits their usage. Let me explain what I mean. If you add both fields to the form and try to fill in the contact, you will notice that Contact (primarycontactid) can be only filled with the contact that is under the selected Account. On the other hand, Responsible contact can be filled with any contact in the contact list. Then if you go to customization area, you will notice, that the filtering is disabled on both fields. 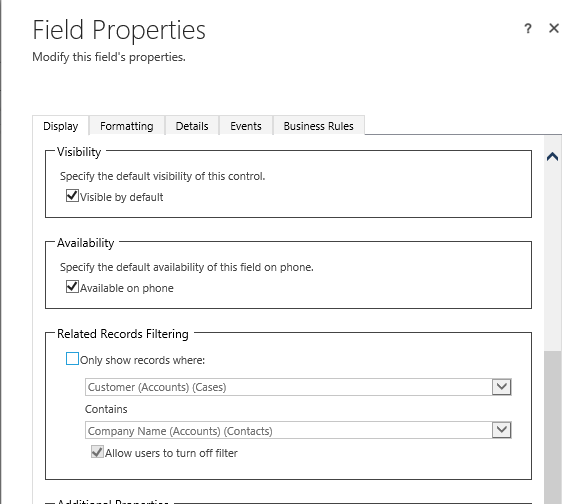 You can enable the filter on both fields and also allow the users to disable the filtering, but it has only effect on the Resposible contact field. On the other one (primarycontactid) it is ignored - even when the user unchecks the check-box, the filter based on customer is still applied. So be very careful when you customize the case and before implementing any rules what should be filled in what field consider this limitation. I realized this because we wanted to use one of the contact fields for storing information about partner contact. Partners are different companies and therefore their contacts can be selected only in the Responsible contact field. Contact - Primarycontactid - contains build-in filter for contacts only under the current Customer (Account) even though. Filter cannot be disabled. Responsible contact - responsiblecontactid - by default not filtering the contacts based on company. Filtering can be enabled. I would like to appreciate your work for good accuracy and got informative knowledge from here. Have a look at the process blogs to see more.